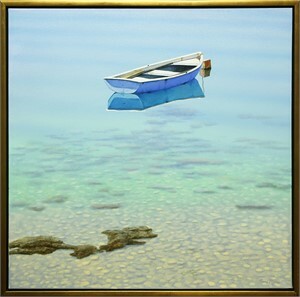 Frane Mlinar's seascapes and nautical paintings break away from the tradition of picturesque images of European coasts, harbors, and towns. Mlinar seems to question the role of the artist as his works often highlight the tools of an artist and the components of inspiration that are usually hidden when creating a work of art. 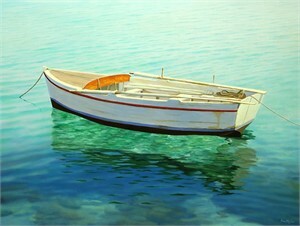 The photograph that the artist usually paints from becomes the subject of Mlinar's paintings, presenting an ironic or paradoxical situation for the viewer. Mlinar takes this even further by painting on such a large scale, defying the idea that trompe l'oeil effects (crinkled paper, tape, butterflies) can only be used in small settings. Born in Split, Croatia in 1959, Frane Mlinar began his artistic training in 1975 at the High School of Art (Department of Graphic Design). Continuing his education he graduated from the Art Academy of Sarajevo in 1981. The following year, at the age of 23, Mlinar became the youngest member of the Croatian Association of Fine Arts. In 1984, he earned a Masters Degree in Teaching Art Techniques. 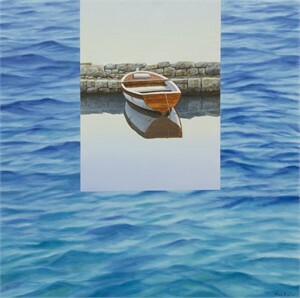 Frane Mlinar's seascapes and nautical paintings break away from the tradition of picturesque images of European coasts, harbors, and towns. Mlinar seems to question the role of the artist as his works often highlight the tools of an artist and the components of inspiration that are usually hidden when creating a work of art. The photograph that the artist usually paints from becomes the subject of Mlinar's paintings, presenting an ironic or paradoxical situation for the viewer. Mlinar takes this even further by painting on such a large scale, defying the idea that trompe l'oeil effects (crinkled paper, tape, butterflies) can only be used in small settings. Born in Split, Croatia in 1959, Frane Mlinar began his artistic training in 1975 at the High School of Art (Department of Graphic Design). Continuing his education he graduated from the Art Academy of Sarajevo in 1981. The following year, at the age of 23, Mlinar became the youngest member of the Croatian Association of Fine Arts. In 1984, he earned a Masters Degree in Teaching Art Techniques.